That is still considered a brand new car. You'd be surprised how many cars are made then sit for 1-2 years before any form of use or have been purchased. You can spot these cars by looking at the model year on the rego tag or the vin. If you are looking to buy an import I generally suggest you DONT and also ask for the VIN and a photo of the VIN so you can check what it was meant to be from factory, colour, options, manufacture date/time etc.. Thanks for that and yes, there is a clear distinction of dates as displayed on the registration. My point was that "Vehicle year" as shown on the registration does not always seem to correspond to the actual build/model year, but the date of first registration in the home market. IE a MY 2018 vehicle can be showing registered as a 2019 year if it was first registered in 2019. 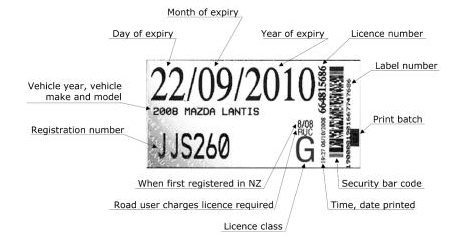 As long as you understand how to read a rego label then you can't go wrong. Always check the VIN to be sure as any person SHOULD be doing anyhow.. Here is an exception. I have a 1999 328I. This is the body shape E36. The E46 came out in 1997 and you could get a 328I in E36 and E46 for the overlap years. So my car was sold brand new 2 years after the new shape had already come out..
Well ... unless your 2008 Mazda Lantis, first registered in 8/08, actually stopped production in '98 (had to have a chuckle at that example). And yes, people SHOULD compare reg to VIN, but as I gather from your previous comments that you are have been in the industry, you and I both know that the average car buyer won't know that the build plate info exists, let alone bother to correlate it before they buy a vehicle. As someone else said, it seems to be a lot more common with bikes; I have seen plenty advertised on TradeMe along the likes of "2009 Yamaha R1" then in the description "this is actually a 2007 MY, but first registered in 2009". EDIT: Fun fact from Wikipedia: The name Lantis is created from the Latin phrase "Latens Curtis", which roughly translates as "To secretly shorten". With bikes there's no steering wheel on the wrong side problem. I know in the past that the NZ Suzuki agents often had limited numbers of surplus old stock from other markets. Probably it's no much difference with the Hyundai advertisement, it's a 2018 inventory but slapping a 2019 name on it. It is misleading - this is more like an attempt to sell an older model at the price of the newer ones. Has Hynundai gone so far down hill they got to shovel a small car off with a new big one? I work in compliance still, every day people write the wrong info for (MY) and also car descriptions. If we don't buy imports then this won't see the issues. You gotta do what you gotta do ... but wow! Buy one car get one car free is something I have not seen before! I have the opposite situation. I have a 2008 build Volvo S60 Japanese import which is recorded as a 2007 by my insurance company as no 2008 built vehicles of what was the old design were imported for sale to NZ, only the new shape 2008 model, so they do not have that year for that model in their database so dropped a year. No big deal as the vehicle is clearly the old shape and a nominal year's difference will not impact resale value 11+ years down the track. The internet taught me something. It will be some tricky marketing job that most probably extracts more money from you than if you got the two cars outright. Well it's actually the same as discounting the suv by 10000, add a 10000 factory psckage, discount the small car by 7000, add a 3000 factory package, which is the usaul eofy antics. Instead they so just make it easy and give the second car at no need for complicated maths. I dont have any problems with this deal. But id rather get the suv at 20000 cheaper. But they want to clear stock. Not Toyota. And I'd wager not any other car manufacturer in the last 20 years. A part may be designed in 1991, but they won't keep stock for 8 or 10 years. And, where a part is bought in, they'll have a continuous stream of parts being brought in daily, so that stock on hand is the bare minimum.